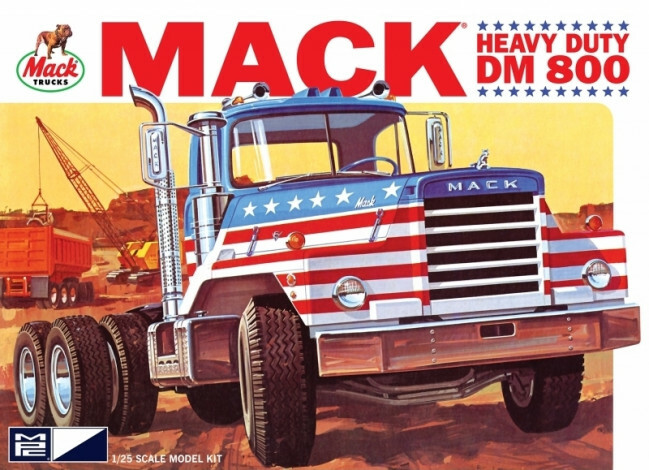 MPC is proud to reintroduce the Mack DM800, “King” of the highway haulers! This amazing super-detailed big rig tractor kit includes all the features of the real thing, but in 1/25 scale: Working “butterfly” hood and “swing up & away” fenders, turbo-charged Maxidyne engine, posable front wheels and loads of gleaming chrome parts! The colourful decal sheet includes stars and stripes graphics along with other new options! Retro Deluxe packaging replicates MPC’s irresistible original release!